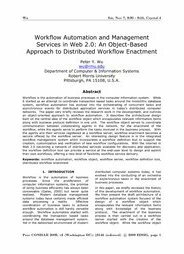 Recommended Citation: Wu, P Y. Workflow Automation and Management Services in Web 2.0: An Object-based Approach to Distributed Workflow Enactment. In The Proceedings of the Conference on Information Systems Applied Research 2009, v 2 (Washington DC): §3145. ISSN: 0000-0000. Workflow is the automation of business processes in the computer information system. While it started as an attempt to coordinate transaction based tasks around the monolithic database system, workflow automation has evolved into the orchestrating of concurrent tasks and asynchronous events for distributed application services in today’s distributed computer networks. The paper very briefly reviews the research work in the development, and outlines an object-oriented approach to workflow automation. It describes the architectural design built on the central idea of the workflow object which encapsulates relevant information items along with business protocol definition in one unit. The workflow object serves to coordinate communication between collaborating agents in the network, for the enactment of the workflow, while the agents serve to perform the tasks involved in the business process. With the agents and their services registered at a workflow server, workflow enactment becomes a service offered by the workflow server. An interesting design feature is in the integrated workflow management system which incorporates a workflow definition tool to support the creation, customization and verification of new workflow configurations. With the internet in Web 2.0 becoming a network of distributed services available for discovery and application, the workflow definition tool can provide a service at the end-user level to design and submit their own workflows, offering a new level of flexibility workflow service delivery.